Last weekend I was once again in NYC. My participation in Simply Stitch 3 has been a wonderful excuse to expand my stash in new ways. And so, I ventured into the Garment District…..and was in awe. I was there on a Saturday morning but still found more than enough shops open. I began with a shop with an online presence that I knew the location of and said it was open early on Saturdays. The B&J store is located on the second floor of the building. B&J Fabrics - I can't speak highly enough of the store. It is located on the second floor of a typical old style NYC office building which reminded me of the Temple Building here in downtown Rochester. You walk into a vast open space with thousands of bolts of every kind of material that you could imagine. I had on my 'lace and embroidered cotton' hat so I focused upon those fabrics. There were more laces than you ever could imagine…..one row of fabrics had beaded lace, another plain lace. I saw prices from about $200 a yard down to about $60. The minimum purchase was 1/2 yard and my budget was limited so I had to make a hard choice. I also found a good selection of embroidered cotton/cotton blends, some imported, in a wide price range. What impressed me the most was the helpfulness of the fellow who cut my choices. He went out of his way to give me suggestions on other shops with lace in the area. And, he was meticulous in cutting my fabric. I would highly recommend this shop to anyone who wants to explore. They are located at 525 7th Ave on the corner of 7th and 38th St. They have a great online site too, I might add, and are happy to ship anywhere. From B&J's, I began to wander. 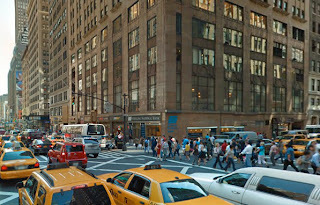 The stores I visited were between 7th and 8th Ave. on 38th and 39th St. They are an easy walk from Time Square and if you were down at Macy's on 34th St., you could just as quickly walk up from there. I was focused upon lace, trim, and thread but there were countless fabric shops. One could easily spend the greater part of a day meandering about. I then continued wandering as there were many trim stores open on W 38th and 39th. 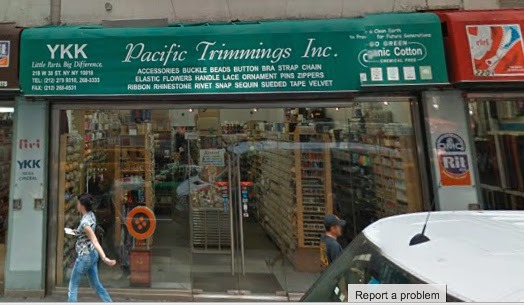 I found one, Pacific Trimmings at 220 West 38th St. that had a wonderful selection of lace trims in a good price range. I would definitely recommend it for a stop. This photo below captures only part of the store front - imagine three times as wide a store. How interesting... thanks for the tour! Linked her from our SS3 Flickr group and was surprised to see we live in the same city! Well, actually, I'm about 30 minutes south.